Time-shifting revolutionalized the TV industry. Now, the time is here for the radio industry. Futuri Media has partnered with Nielsen to study the perceptions and attitudes of a variety of audiences on time-shifted audio. The study concluded that there is a profound appetite for time-shifted radio content among radio listeners - notably, highly monetizable and younger audiences - and that opportunities are currently untapped as awareness of the availability of time-shifted radio content among listeners remains low. Download the free white paper now to learn how to develop a strong time-shifting strategy and untap the potential to grow your station's audience and revenue today. Futuri Media, with a team of 100 made up of roughly half broadcast professionals and half technology professionals, developed POST with the unique needs of radio in mind. POST makes it easy to take the PPM-encoded audio you’re already creating and get it out into the marketplace quickly, helping you take advantage of Nielsen’s time-shifted listening policies. 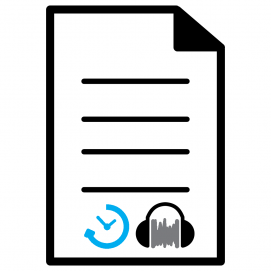 You can manage and distribute your non-broadcast content, like extended-length interviews and episodic podcast content, right from the same system. POST’s logger capabilities make airchecking your talent a snap, even when you have multi-market responsibilities. And that’s just the start of what POST can do to supercharge your on-demand efforts. Learn more about POST by contacting us or visiting futurimedia.com/POST.